Want to stay true to the original? If sticking with the same features as the original is important to you, your decision is already made — as long as you have a solid donor. While most of the early Land Cruisers were available as soft tops or hardtops, most FJ40s sold in the U.S. were originally hardtops. Something to keep in mind, if authenticity is a priority. Hardtops require more labor to restore than soft tops – so naturally, they’re more expensive. A hardtop means there’s more metal to prep and paint, and more seals and windows to install. This also makes them more expensive to repair or replace. Do you love the freedom of the open air? Love the feel of the wind flowing through your hair as you’re cruising around town? Go with the soft top. Ours are made by our in-house upholstery specialist and are replicas of the soft tops Toyota produced for non-U.S. markets. These tops do not fold back completely. Instead, the side windows roll up, giving you open-air versatility and an authentic look. The hardtop is going to be much quieter at all speeds, making it easier to talk to your passengers or make a quick, hands-free call. While there are straps to hold the soft top in place, the fabric will flap around slightly at higher speeds. For some, this is part of the charm of owning a classic Land Cruiser, for others, it is an annoyance. Got lots of extra gear? If you’ve got a surfboard, luggage or ski rack, then you’ll want to seriously consider the hardtop. As rugged as our soft top is, its structure is not made to support a roof rack and a bunch of extra stuff. In the northern U.S., we’ve seen our share of soft tops roaming around, even in cold temperatures. That’s a testament to just how good modern heating systems have become, and at The FJ Company, ours do a good job of keeping things comfortable. That being said, if you’re cold now, you’ll be even colder in your soft top. You’ll get extra insulation from a hardtop, which means more protection against below freezing temperatures and strong winds. Brrrr! With both types of tops, your Land Cruiser will come with a standard roll bar or a custom roll cage. 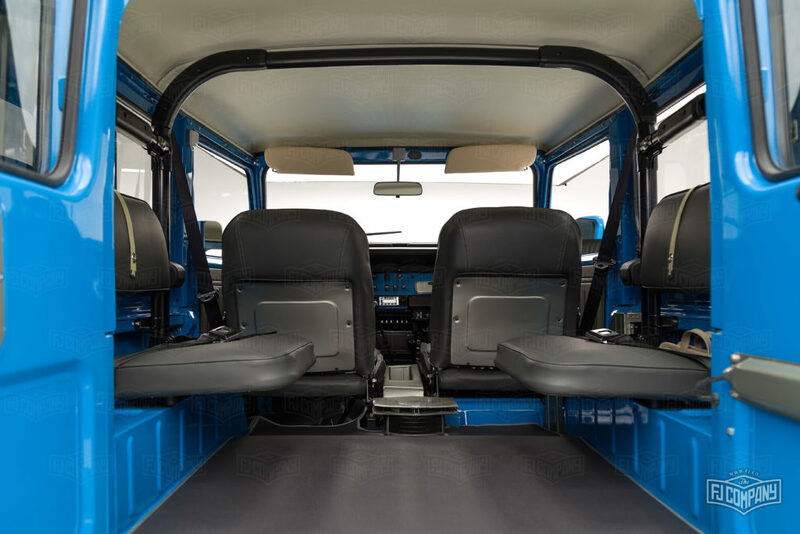 The roll cage provides extra protection for the cabin and is worth its weight in gold if you’re planning to do lots of high-speed driving or off-roading. For even more peace of mind, you can consider the all-steel hardtop. Do you live in an area where break-ins are more common, or plan to take your Land Cruiser to a campground where you’ll use it to lock up valuables? A hardtop will help deter would-be thieves. While our soft top is made of tough materials, it could always be slashed. Then again, many of our customers drive home a soft top and never have a problem. Just consider your driving environment before making your choice. Oh yes, looks do matter, and sometimes, when you see the top you like, you just know. Some people like the premium look of the hardtop, others prefer the classic look of the soft top. In the end, it’s up to you. Whatever option you choose, you’ll have one quality roof over your head. So, go with your gut and just let it roll. Or, get both — just make sure you have the space to store that extra top. You’ll also need an extra set of hands and some serious know-how to switch them. If you’ve never worked on cars before, we recommend hiring a pro to put your top on for you. 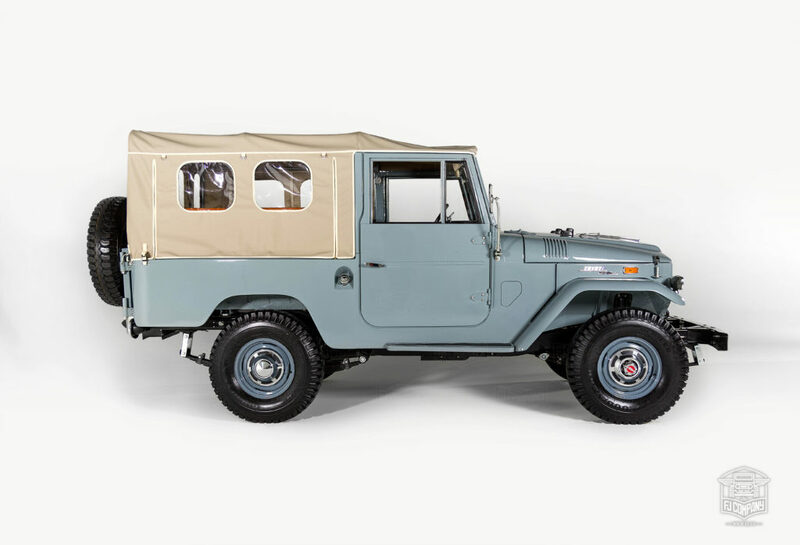 Ordering an FJ43 Land Cruiser? 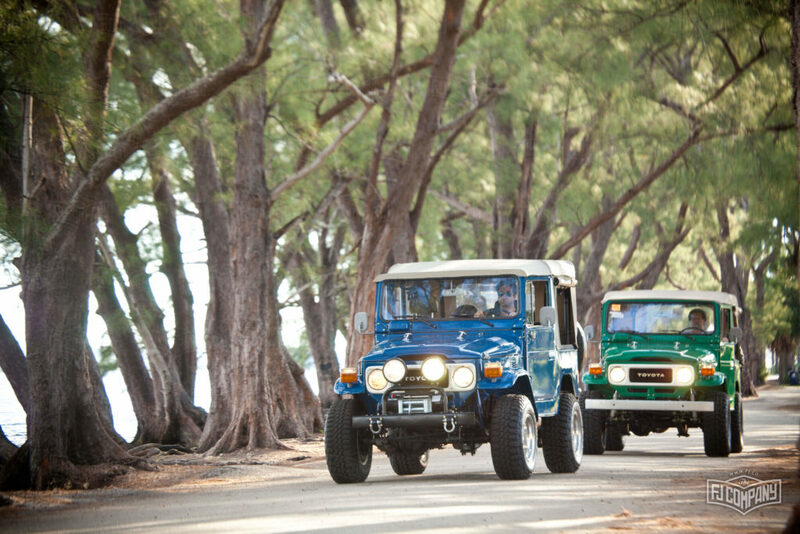 At The FJ Company, we sell FJ43s with a soft top or an optional hardtop. 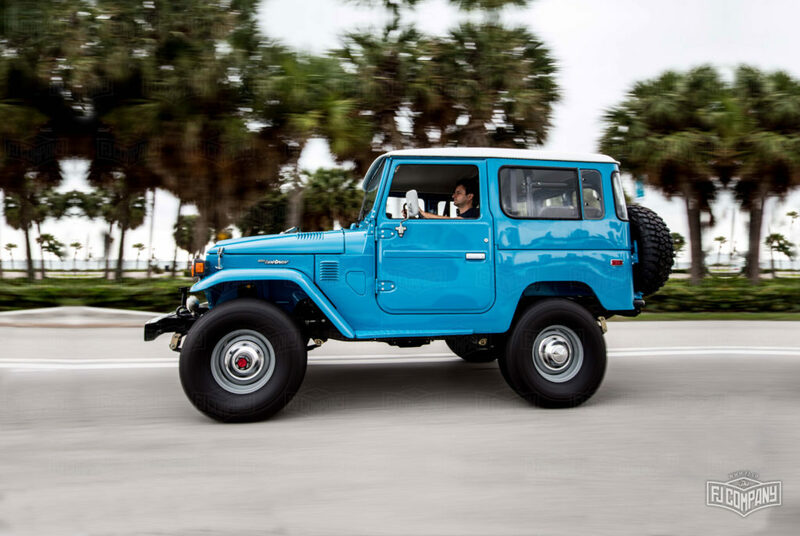 Back in the day, FJ43s were sold with a factory soft top only – some owners added an aftermarket fiberglass hardtop, but that wasn’t a good look. 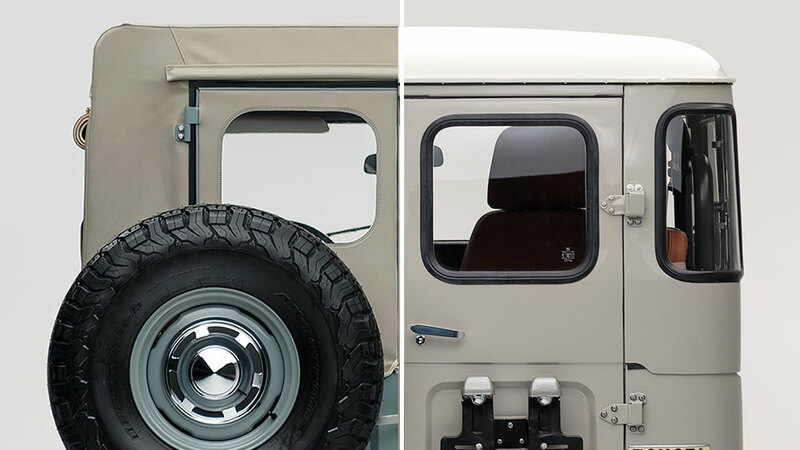 Our hardtops are made of steel and look just like FJ40 hardtops from the factory – only longer. Definitely a great option, if you’re looking for something unique. Ready to make your choice? See a visual of a hardtop vs soft top with our online FJ Land Cruiser builder! prev postSee you at The SEMA Show! next post How do I know if this Land Cruiser was restored by The FJ Company?